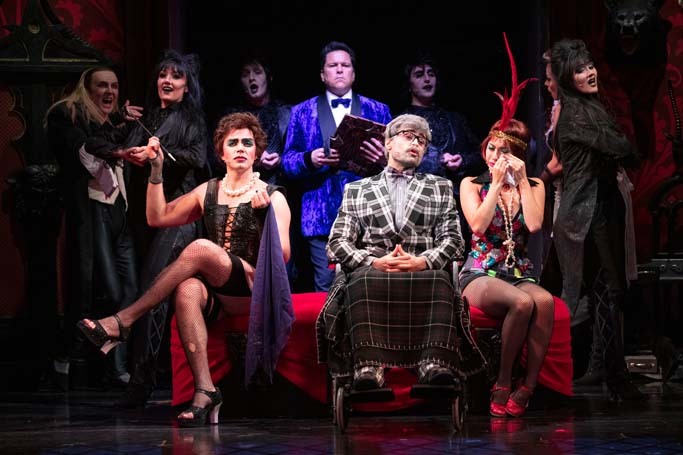 Forty five years on from its premiere at the Royal Court’s Theatre Upstairs, The Rocky Horror Show isn’t the radical beast it once was, thrusting its sexual and gender fluidity in our faces. 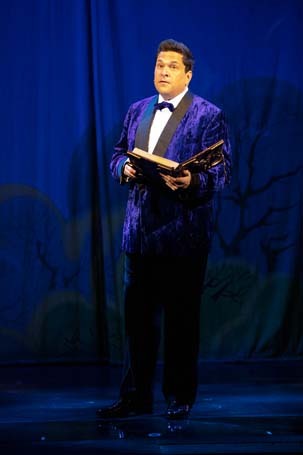 In fact, it launches its latest tour in Brighton at the storied Theatre Royal as an alternative booking for a Christmas panto, and in some ways this is what it most resembles: there’s a lot of call-and-response with the audience (most of it prompted by the two men on the sound desk at the back of the stalls), audience participation and lots of elaborate costumes – on both sides of the footlights. Now that its shock value is inevitably diluted, it feels more like revisiting an old friend. Christopher Luscombe’s production is kept fast, fresh and funny thanks to an effervescent cast that don’t send it up outrageously but treat it with the due seriousness of its satirical intentions. 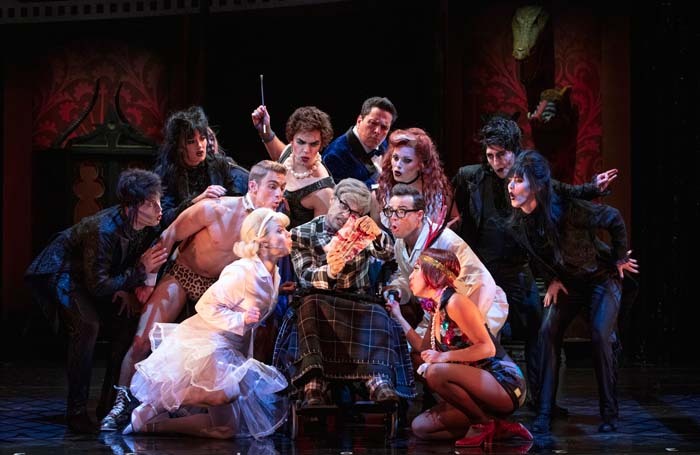 Ben Adams and Joanne Clifton are the perfect cookie-cutter virginal 1950s couple Brad and Janet who stumble unwittingly into the sexually subversive lair of Stephen Webb’s Frank N’ Furter. Like Little Shop of Horrors a decade later, Rocky Horror is inspired by B-movie sci-fi, with aliens attempting an assault on earthlings. In the age of #MeToo, some of these uninvited assaults may be a little hard to bear, but Richard O’Brien’s songs have a disarming lyrical grit, grace and tunefulness that have deservedly made many of them standards. They are punchily sung, not least by Webb, who resembles a dragged-up version of John Barrowman. 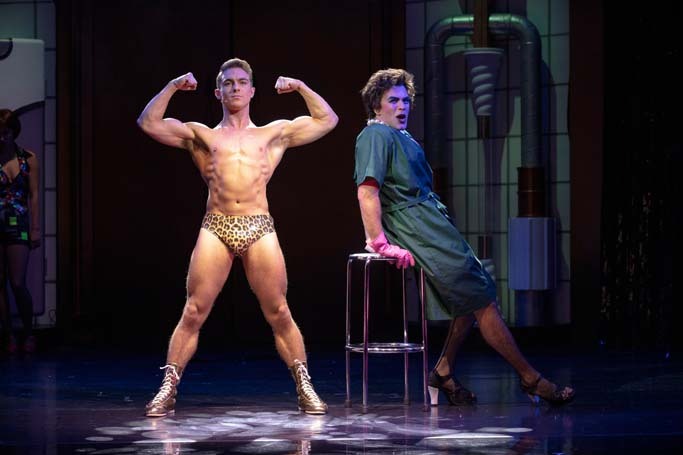 Rocky, his beloved creation, is played by Callum Evans in the briefest of briefs. 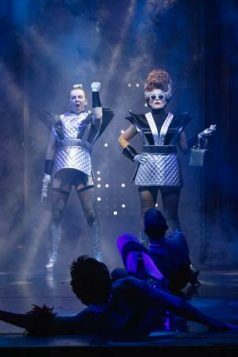 Hugh Durrant’s cartoon-like sets provide their own witty commentary, as do Sue Blane’s original fishnet-heavy costumes.